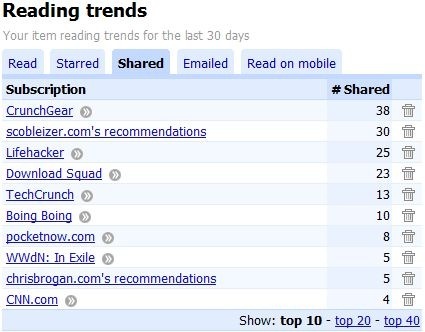 p>I love Google Reader and like to check out my trends every so often to see how many items I’ve been reading & sharing. 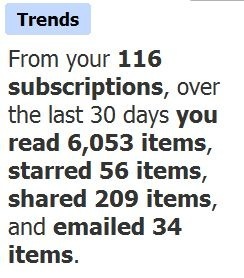 My guess was that the number of read, shared and starred items would have decreased over the last 5 months. I spend more time getting my information from sources like Twitter & FriendFeed and just assumed that I was stealing it from Google Reader. Apparently, that isn’t the case. It would have been fruitful to have installed a monitoring app on my system to determine what I have given up over the last 5 months. I suspect now that Wikipedia, Snopes, and Facebook have taken the brunt of the loss. The last time I posted my stats (June 18th) I had read 4,672 items from 110 subscriptions, starring 22, sharing 217 and emailing 4 over the previous 30 days. In the last 30 days, I have read 6,053 items (29.5% increase) from 116 subscriptions (5% increase), starring 56 (154% increase), sharing 209 (3.6% decrease), and emailing 34 (675% increase). I have also noticed that what I am sharing has changed a bit over time. Initially I was focused on GTD and lifehacks, now I don’t really have a strategy other than sharing what I find interesting. Recommendations weren’t in my top 10 last time, now scobleizer.com’s recommendations & chrisbrogan.com’s recommendations are high on the list. Probably one of the reasons I find FriendFeed & Twitter so interesting. I am not sharing items more frequently than I used too, but I am starring & emailing them more often. I typically star items to reread and/or research and email those that someone else will find interesting. While I add feeds on a regular basis, I also prune them frequently too and have resulted in only a net gain of 6 feeds during the last 5 months. There is a tech focus to what I am reading & sharing right now, it might be time to expand my RSS subscriptions. However, most of the non-tech info (politics, sports, news, general interest) I read comes from FriendFeed and Twitter, so maybe I don’t need to broaden my RSS horizons just yet. If you are a Google Reader fan, it’s worth taking a look at your trends, if only to get to know yourself a little better.